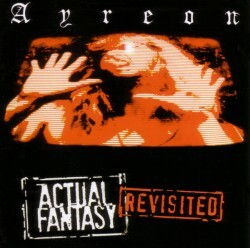 Originally released in 1996 on the Transmission label, Actual Fantasy is the second album in Arjen’s Ayreon project. Instead of having a continuous story with a beginning and an end, the the individual songs are based on fantasy and sci-fi movies, or on stories Arjen wrote himself. The first ten thousand copies of Actual Fantasy featured a bonus CD-rom track: a full-length animated video clip for ‘Stranger From Within’. The second version of the CD featured two bonus tracks: ‘The Dawn of Man’ and the single version for ‘Stranger From Within’ replacing the video. A reworked version of the album was re-released in 2004 by InsideOut music, as “Actual Fantasy Revisited.” This is the version that is currently being sold today. – Video featurette of recording drums, bass and guitars for the new 2004 version. On ‘Actual Fantasy’ Arjen wanted to stimulate fantasy, not simulate reality. Actual fantasy is the opposite of virtual reality. This song is the intro of the CD and starts like a fairy-tale, beautiful, with a classical orchestra. Synn is the old spelling for ‘sin’ and also refers to the important role of the synthesizer on the CD. Inspired by the movie ‘Name of the Rose’ with Sean Connery, the song tells the story of a monastery where laughter is strictly forbidden. One by one monks die mysteriously each having a blackened finger and tongue. It turns out that the monks have discovered a book of comedy written by Aristotle, but the pages are poisoned; if you lick your finger to turn a page it will kill you. In this story that Arjen wrote himself, doctors are trying to find a way to help a girl who is in a coma. In this state she begins to fantasize about some stranger. He could be dangerous, or harmless, or just a magician. The stranger tells her that she can cure herself using her own imagination, and then he allows the doctors to ‘shoot’ him as he takes the disease with him. The girl wakes up and the stranger from within has become part of her. This song is a story Arjen wrote himself. It is about someone who has been playing a computer game for days. At a certain time he isn’t able to tell anymore whether he’s playing a game or has become part of it. He doesn’t feel any emotions and has become like a hologram unable to find a way out. This song is certainly not an attack on computers, for this album could never have been made without computers. It just all depends on how you use computers and virtual reality. This is story Arjen came up with during the last few days of his father’s life. The story is set in the Middle Ages during the days of the crusades. One of the crusaders is ambushed and killed. After that it’s a familiar story: he sees a light and he rides towards it on a road that disappears on the horizon. Beyond it is the ‘last horizon’: death. In most stories it says there is a beautiful light or heaven. But where he is, there is darkness. There is nothing beyond the last horizon; he will disappear. This song is based on ‘The Navigator’, an obscure Australian movie. It’s about a boy in a medieval English village where the plague is killing most of the inhabitants. The boy falls and has a vision: in order to cure the village they must dig a hole straight through the earth, and- on the other side- place a cross on top of a silver tower. In this story, written by Arjen himself, a boy lives in a space station. Humans have lost the ability to feel but he overhears the older people telling stories about the days when they lived on earth. On his computer the boy finds images of the most beautiful things, such as flowers and mountains, but he also finds out that earth was destroyed by wars and environmental disasters and people eventually had to live in space in order to survive. The boy realizes that after seeing people with emotions, and their laughter, he would rather have died on earth, than be in the cold space station. Based on the movie ‘The Neverending Story’. A boy steals a book from a store. The boy arrives too late for class, sneaks into the attic and crawls under a blanket to read the book. The fictitious world of ‘Fantasia’ is falling apart; it’s being eaten by the Nothing. Symbolizing the fact that nobody’s fantasizing anymore. The hero in the story has to cure the empress from her disease, and save ‘Fantasia’. He does so by giving the Empress a name. This is a very experimental song with vocoder and scratches on it. The story is based on Stanley Kubrick’s ‘2001’ and ‘2010’, but with Arjen’s own fantasy and interpretation incorporated. The listener should do the same; the lyrics cannot be explained one way. Just use your imagination! After mixing “Star Child” in dolby pro-logic and “Day Eleven: Love” in 5.1, Arjen couldn’t wait to mix an entire album 5.1. The first real opportunity came up when InsideOut began planning their release of the Ayreon back catalogue. Arjen was also eager to give the least selling and seriously overlooked second Ayreon album Actual Fantasy some new attention. For years Arjen had wondered what Actual Fantasy would sound like with real drums, instead of the drum computer. And when Arjen began working with drummer extra-ordinaire Ed Warby on Ayreon and Star One recordings, the idea grew: wouldn’t it be great to record the album with real drums? It was a daunting task that kept Arjen from considering it seriously. However, in order to make a 5.1 mix work for the album he had to re-record a number of elements that were lost, and remaking the album by recording real drums became a serious option.